The DS18B20 is a temperature sensor that can be used in various simple projects. This part uses the 1 wire (I2C) bus and you can connect multiple sensors up to your Arduino. The part is also relatively low cost and only requires an additional 4k7 pull up resistor. In the example below we shall make a basic example that reads the temperature and outputs via serial and can be verified using the serial monitor in the Arduino IDE. 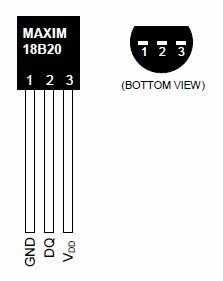 As always be careful not to get the connections incorrect, you can refer to the pinout for the device below to help . The DS18B20 can be powered by between 3.0V and 5.5V so you can simply connect its GND pin to 0V and the VDD pin to +5V from the Arduino Duo. 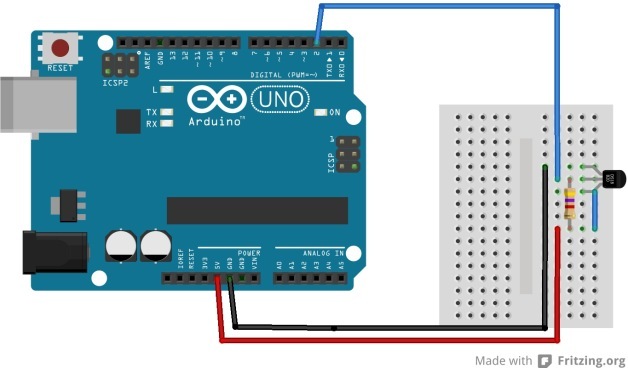 Here is the connection diagram showing how to connect your arduino to the resistor and sensor. You need to download 2 libraries and copy them into your Arduino libraries folder. When you upload the sketch, go to Tools -> Serial Monitor and you should see something like the following. Put your finger on the DS18B20 and you should see the temperature vary.